Imagine a village where no birds scatter to the pines as people pass, where no dogs wait panting by the door, no chickens peck for grain in the garden, no fish sparkle in the river. Such a village, gray, sad, and weighed down by an unspoken guilt, is the setting for the new children’s book, Suddenly in the Depths of the Forest, by noted Israeli writer and peace movement activist Amos Oz. Short, poetic, and haunting, the book operates on a plane of mystery somewhere between fable and fairy tale. Instead of facing their memories, adults frighten the children with tales of Nehi the Mountain Demon, who sweeps through the village at night to steal away any living thing he finds not locked away. Fear is the price of the adults’ silence, and children mock anyone who still believes that animals exist or could possibly return. 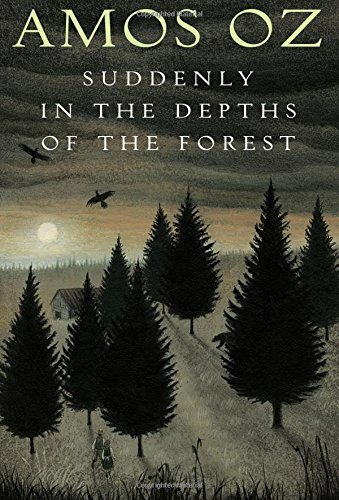 Suddenly in the Depths of the Forest tells the tale of three children who don’t quite fit into their village’s structure of denial. First is Little Nimi, whose runny nose, gapped teeth, and strange belief in animals lead the other children to tease and torment him, until one day he runs away into the forest. Three weeks later he returns, filthy and happy and apparently incapable of any speech but whooping. Next to wander are timid Matti and his bold and stalwart friend Maya, who one day glimpse a fish in a puddle, “flittering like a knife in the water, shimmering live-silver scales dancing.” Seeing the fish becomes a profound spiritual experience that imbues the children with a sense of the connection among all living things. Thereafter the friends begin to hear the sounds of dogs barking far away, until they finally resolve to enter the forest and see what they can find. In the forest, Matti and Maya encounter fear and wonder—Little Nemi, and Nehi the Mountain Demon—as they contemplate loneliness, defensiveness, and the cruelty all children and all adults sometimes display. The story ends on a note of sober hope that little by little, each of us can chip away at cruelty within our own hearts and communities. Then, maybe, the animals will return. The great beauty of this story is the rhythm and clarity of its evocative language. Enlarging the story’s impact is the sense of timelessness in the village and its characters, such as the old man Ginome, who has shrunk to the size and helplessness of a baby, or the ex-fisherman Almon, who whittles the shapes of animals and argues for hour with a scarecrow set up to frighten crows who never come. Matti and Maya are archetypes, not characters full of realistic quirks and characteristics. Their dialogue is never set apart in quotation marks, but flows from the sentence structure. Some children may feel that the story doesn’t have the kind of adventurous plot and resolution they’re accustomed to; others may decide the message about kindness is just one more preachy admonition in a world of anti-bullying talk. But for children who love language or children given the opportunity to hear this hauntingly lovely book read aloud, the story may resonate for years to come.